For years I have struggled to make mashed potatoes taste buttery without dairy. I avoid using margarine in general, but capturing a creamy texture and flavor proved difficult without it. 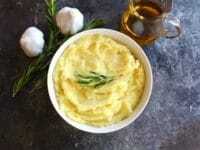 This year I experimented with olive oil, roasted garlic and rosemary in my mashed potatoes. The results are amazing! 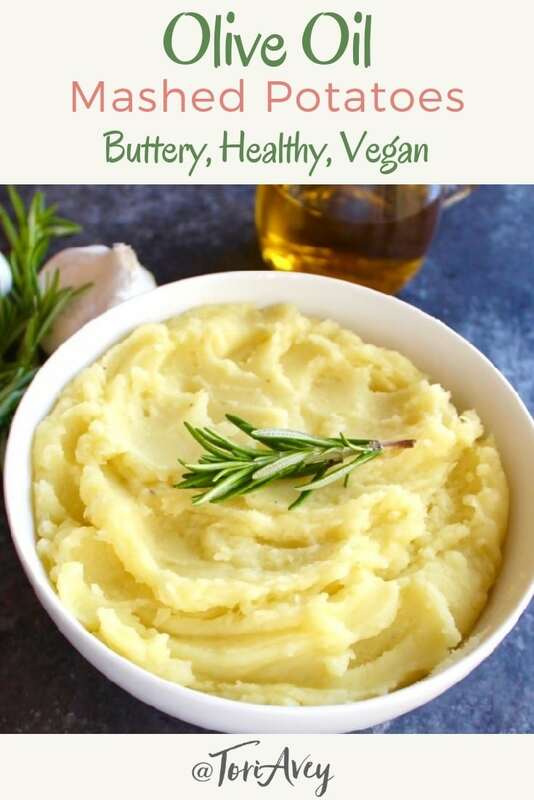 This is my new go-to recipe… I actually like it better than mashed potatoes made with butter and cream. These Olive Oil Mashed Potatoes truly taste buttery. I got the basic idea from the New York Times cooking section, then modified the process until I found a perfect balance of flavors. The key is choosing quality ingredients and a good, mild flavored olive oil. I use Bragg Organic Extra Virgin Olive Oil and it’s just right for this purpose. Yukon Gold potatoes provide the best texture and flavor. Simmering fresh rosemary with the potatoes gives them just a hint of herby flavor. Delicious! Slow roasting the garlic cloves in olive oil is key here. This gentle process gives a lovely garlicky essence to the mash. 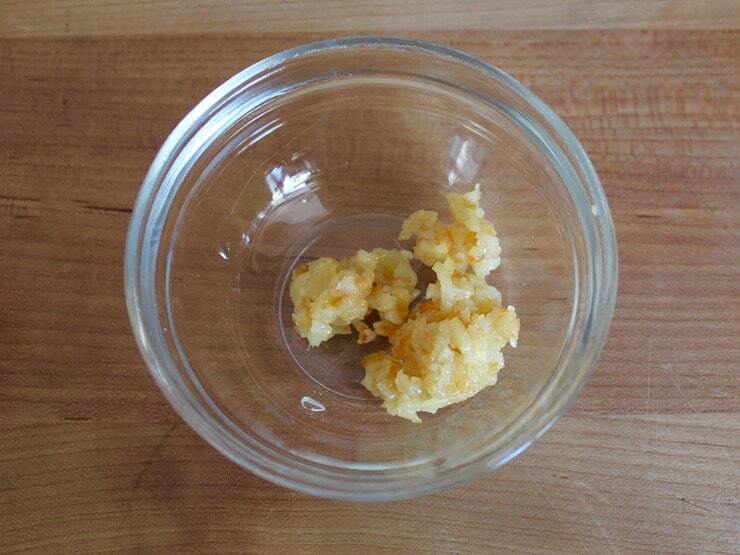 If you like a stronger garlic flavor, chop the roasted cloves and whip them into the mash at the end. For my family, the olive oil alone has more than enough garlicky flavor. This recipe is vegan, healthy, parve and flavorful. Prepare to be amazed! 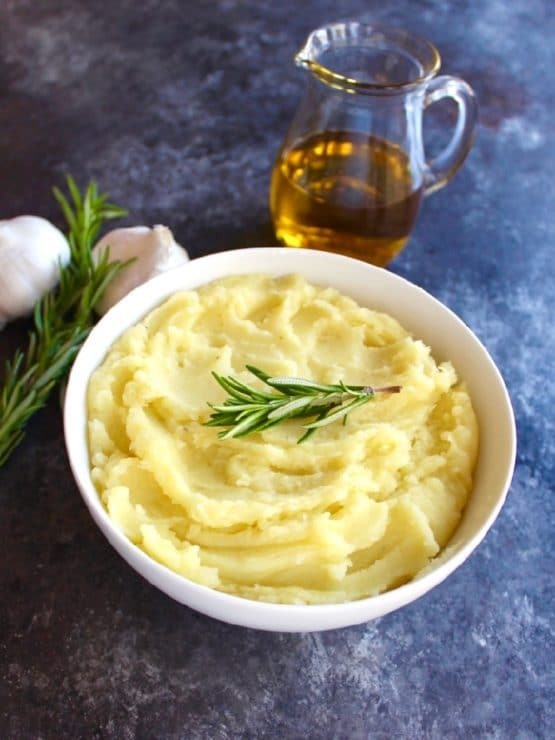 This creamy vegan mashed potatoes recipe is made with garlic-infused olive oil and rosemary. Buttery flavor without butter or margarine. Dairy free and vegan. Makes 3 cups mashed potatoes, serving size 3/4 cup each. Nutrition calculated using 3/4 tsp salt. Not all of the salt is absorbed from the cooking water. You can adjust salt to taste, sodium content will vary based on the amount of salt you use. Be sure to use a good quality mild, smooth olive oil. If you double the recipe, do not double the salt in the cooking water - use 3 teaspoons instead of 4, then add salt to taste at the end of cooking instead. Add extra virgin olive oil to a small skillet. Place the garlic cloves in the skillet. Heat the olive oil over medium for 2-3 minutes, watching carefully, until it just begins to sizzle around the edges of the cloves. Don't let them sizzle too long or you will start to fry them. Reduce heat to low/medium low. Stir well to coat the cloves in the hot oil. Let the garlic cook slowly for 20-30 minutes, stirring and flipping the cloves every few minutes, until the cloves are soft, tender and golden. While garlic is roasting, proceed to next step. 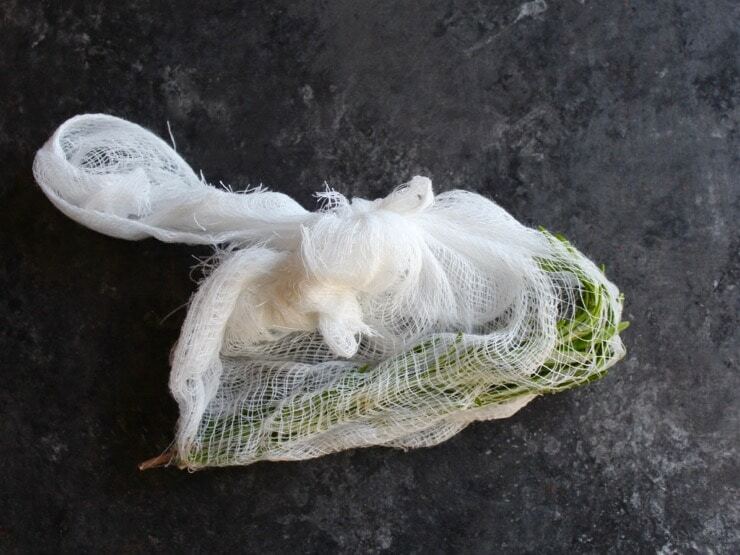 Wrap the 2 sprigs of rosemary in a piece of cheesecloth and tie in a bundle. Fill a large saucepan with enough water to cover the potatoes by 2-3 inches. Boil the water. Add 2 teaspoons of salt to the cooking water after it starts boiling. 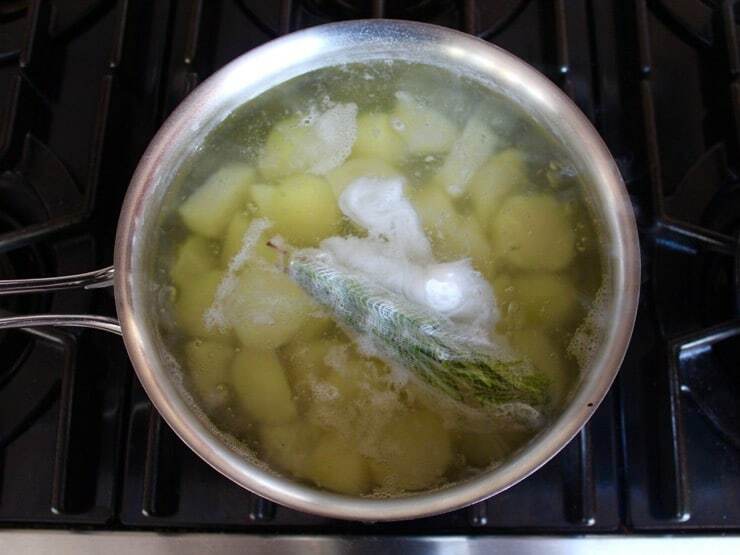 Add the potato chunks to the boiling water along with the rosemary bundle. Let the potatoes cook for roughly 20 minutes until tender. 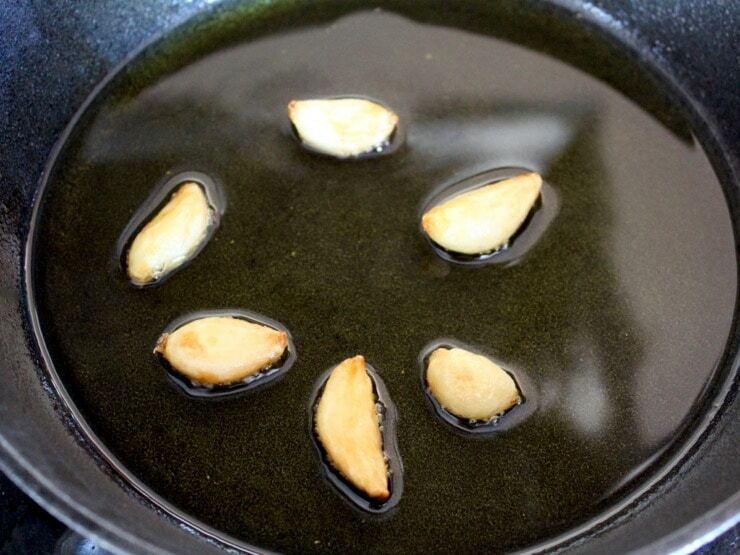 When garlic is done roasting, remove the roasted cloves with a slotted spoon and let the oil cool. When potatoes are done cooking, remove the rosemary bundle and discard. Reserve 1 cup of the cooking water before draining the potatoes in a colander. Return potatoes to the hot pot. 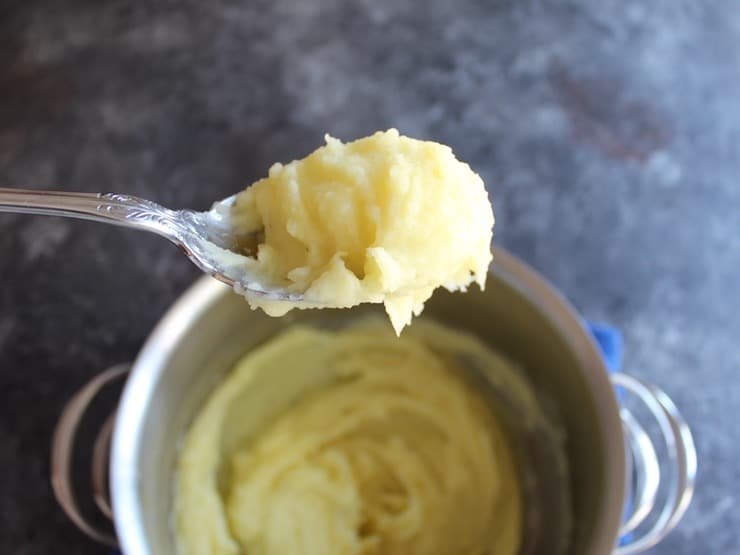 Use an electric hand mixer or a potato masher to begin mashing the potatoes. Be sure to beat on the lowest speed throughout the process. When the potatoes have turned crumbly, add all of the olive oil and a bit of the cooking water (adding 1-2 tablespoons at a time) and continue mashing until the texture you desire is achieved. Add additional salt and pepper to taste as desired. 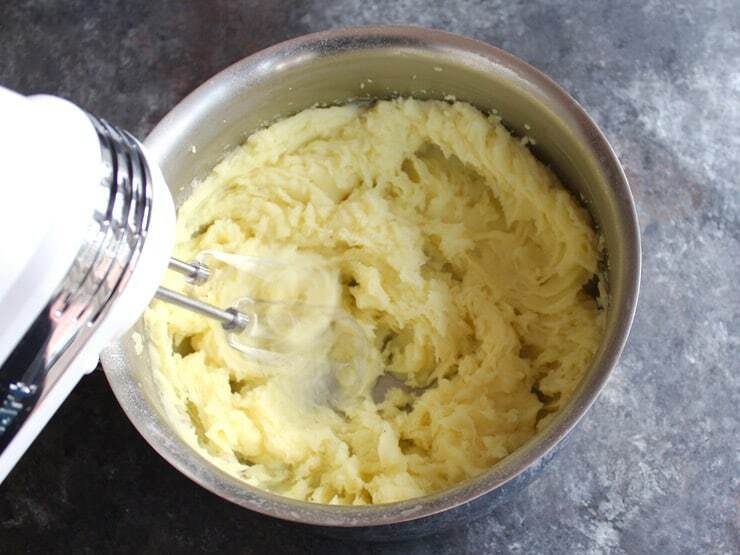 I prefer a using an electric hand mixer for a very smooth, creamy mash. One caveat - you should ONLY mix until you achieve the desired texture. If you mix too long or on too high a speed, your potatoes will become gummy. You can also use a hand masher if you prefer, which will eliminate the risk of gummy potatoes. Hand masher tends to work better for very large batches. 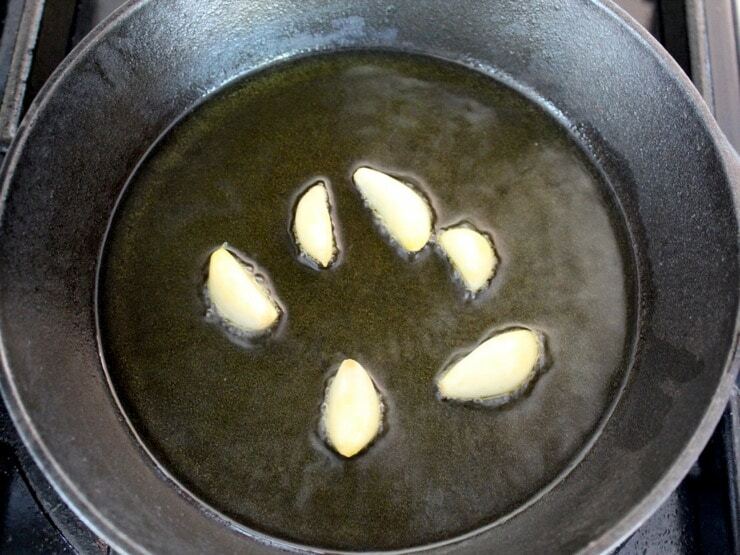 The olive oil will impart a nice mild garlic flavor to the potatoes. If you want a very garlicky mash, you can mince the roasted garlic cloves and stir them into the mash. Taste before adding; my family prefers it without the added garlic. Thanks so much for this easy and tasty dish. i like your way to explanation of recipe. this is so easy and ready in less time. very soon i would like to make this dish at my home. once again i want to thank you for all information. Can these be made day ahead? Yes, please read my response to Daniel’s comment which answers this question. I do prefer them made fresh, but they won’t suffer much by being made a day ahead. I have one vegan guest coming tomorrow. Definitely will be making a portion of the cooked potatoes for her with your recipe. Thank you and many Thanksgiving blessings to you and yours. This recipe looks wonderful. Can this be prepared ahead of time, say 1 or 2 days? 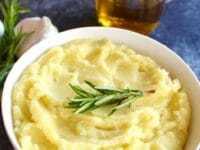 How would you reheat to keep flavor and consistency of the mash potato? Thank you. Hi Daniel, yes it can. I prefer to reheat on the stovetop. Put a little water in the bottom of the pot (no more than 1/4 cup), then add the potatoes. Reheat them over medium, stirring frequently, until they return to the original texture. Add a little more water as needed. Another great recipe. Cooked this last night and it was a hit! Simple but it tastes wonderful. Fantastic! Glad you liked it.